Happy Friday! This week has been a fun one for us girls with the best weather and afternoons spent on long walks and picnics at our local park. Dustin and I went out for dinner last night to our favorite hibachi restaurant to continue his birthday celebration and it was so nice to get out just the two of us. Last week was filled with a lot of running around to errands, appointments, etc. and this week has been much more low key which has been nice. We don't have any big plans for the weekend ahead which I'm actually looking forward to, because last weekend was quite packed. It's nice to have busy weeks and then slow ones, I definitely thrive on that variety and need those breaks of slower paced days. To kick off your weekend, I've rounded up a handful of Friday Favorites!! one || This shower curtain is on my wish list. I don't think I could ever justify spending that amount on a shower curtain but maybe some day I'll catch it on a super sale! We have a beautiful floral one in our master bathroom but I have been on the hunt for something a bit more "Fall" and this one is stunning! I also love this one if you're floral-obsessed like I am. two || This striped diaper bag from Bodomint is the diaper bag of my dreams. It arrived this week and I haven't stopped finding things I love about it since! Created by Rebecca Waldron, while living in Hawaii and on the hunt for a multifunctional but stylish bag that she could use with her son, together with her husband Tyler she put her degree in fashion design and experience in the action sports industry to good use and created her bags! 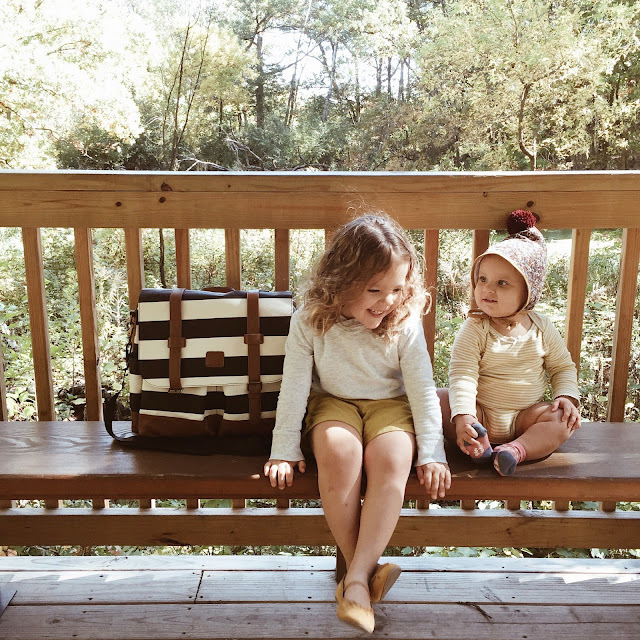 Bodomint was successfully funded on Kickstarter in 2014 and their bags have been in high demand since. 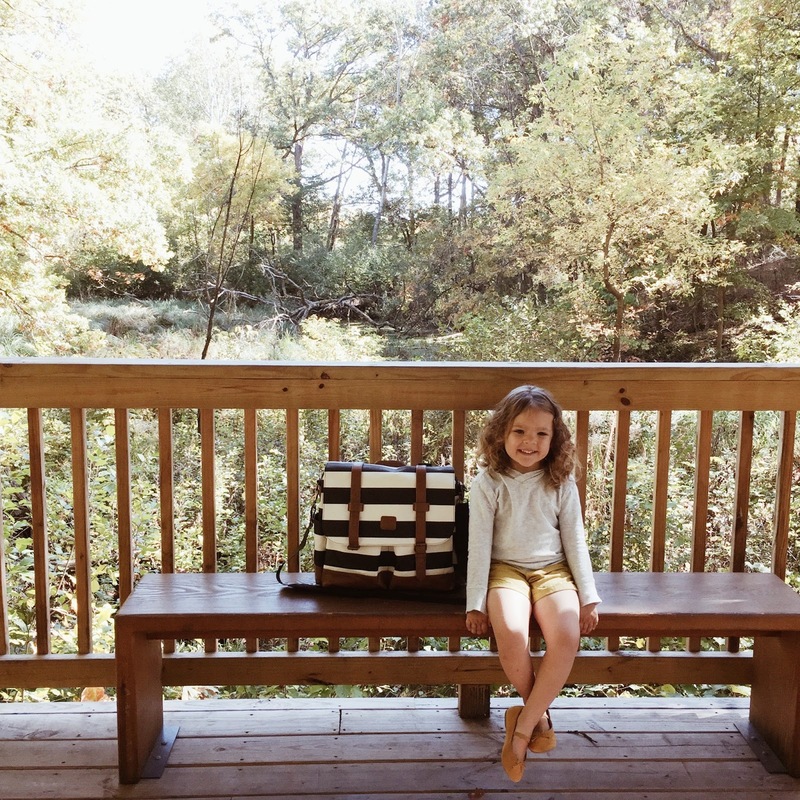 I've used many diaper bags since having Olivia 3.5 years ago and this is hands down my favorite thus far. It is more spacious than any I've used in the past and has so many pockets inside and out to keep everything organized. It can be worn as a backpack, over the shoulder or carried by a handle like a handbag, a feature I just love. I'll be sharing more about it in an extra special post soon, but for now had to rave because I am obsessed. You can preorder the striped bag here and it will ship within a week or two! They also come in black and those are estimated to ship late November. Briar Handmade // Heirloom quality bonnets in all sorts of patterns, including beautiful Liberty of London florals. We love this buttercup one for Fall. Hello Charlie! // Run by my dear friend Madie, this Starry Night bonnet in caramel is on it's way for the new baby, it's perfectly gender neutral and you can have it lined with sherpa for those colder months ahead. I also love this Fall Tapestry one, a new favorite for Penelope. four || I love all things Fixer Upper and these Ford Vases are probably the neatest I've come across. 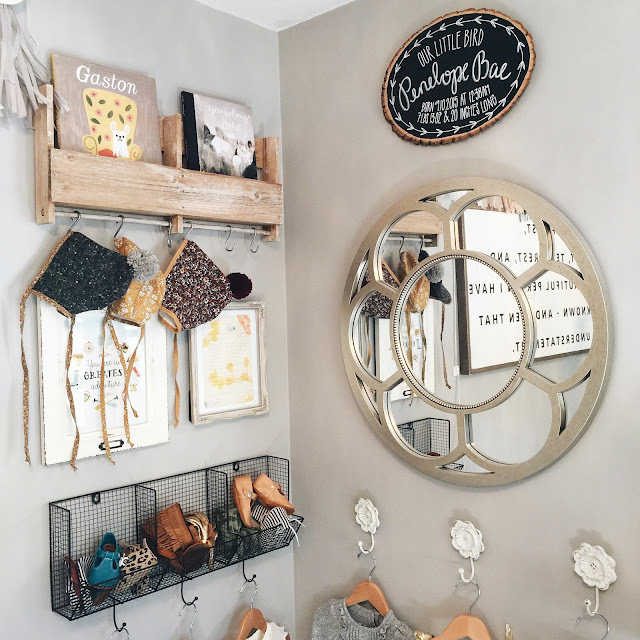 five || I shared earlier this week on instagram @blessednestblog a picture of one of my favorite corners in Poppy's room and had so many of you ask about the shoe holder. I love displaying the girls' shoes and accessories in their rooms as much as possible, it makes for the best functional decor ;) The wire basket with hooks underneath can be found online here. I also love this wood wall cubby. What have you been loving lately?! Share your favorite finds below. Hope you have the best weekend!